(HARLINGEN) – Yvette Martinez is part of the first cohort from Texas State Technical College’s Registered Nursing program that will be graduating in July and is preparing for her future by attending the Nursing Career Expo. The Nursing Career Expo, a first for TSTC and organized by the college’s Talent Management and Career Services, was hosted Monday at the newly renovated TSTC Nursing Center. Martinez and her classmates, and students from the vocational nursing program, had the opportunity to visit with at least 11 potential employers such as Valley Baptist Medical Center, Harlingen Medical Center, South Texas Health System and numerous clinics and home health agencies. 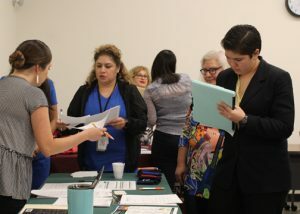 Prior to the expo, students like Martinez received assistance from career services representatives in resume building and interview skills to prepare them for on-site interviews also hosted during the event. Shirley Byrd, TSTC’s Registered Nursing program director said this expo was needed for the vocational and registered nursing students. TSTC Vocational Nursing student Maria Melendez, who will also be graduating in July said this expo has helped her expand her horizons. Melendez said her experience at TSTC has been memorable. From her instructors, the hands-on training and the new friends she has met, it has encouraged her to return to TSTC for the registered nursing program after she graduates. Heather Sauceda, TSTC Vocational Nursing program director, has recently seen her students achieve consecutive 100 percent national board exam pass rates and has seen a job placement rate that is close to 100 percent. Lashbrook said they are working statewide to fill the gap by increasing enrollment in the nursing programs from 30 students to 40 students at TSTC’s West Texas campus and will do the same at the Harlingen campus in the near future. For Martinez and Melendez it will still be a few weeks before they find out if they are offered nursing positions, but both agree that TSTC has given them the opportunity to pursue their passion: caring for others.